Making your own cookie mix ahead of time makes preparation of homemade cookies so easy and economical, too! Cookie mixes also make great gifts. For Cookie Mix: In very large bowl or 6-quart Dutch oven, stir together flour, salt and soda. Add sugars, mixing well. Cut in shortening with pastry blender or two knives until well blended. Stir in oats. Store in tightly covered container in refrigerator or cool dry place up to 3 months. For Cookies: Heat oven to 350°F (175°C). Lightly grease cookie sheet. In medium bowl, combine all ingredients. Mix with spoon or fork about 1 minute to form a stiff dough. Drop by rounded teaspoonfuls onto prepared cookie sheet. Bake about 15 minutes or until light golden brown. Cool 1 minute on cookie sheet; remove to wire cooling rack. Makes 2 dozen cookies per batch. *If using old-fashioned oats, increase flour to 3 cups. **If Homemade Oatmeal Cookie Mix is prepared with old fashioned oats, increase amount of mix used for making cookies to 3 1/2 cups. For Raisin-Spice Cookies: Add 1/2 cup raisins, 1/2 teaspoon ground cinnamon, 1/4 teaspoon ground nutmeg and 1/8 teaspoon ground cloves. 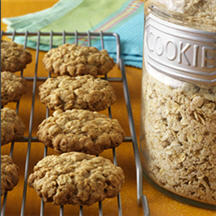 For Oatmeal Chippers: Add 1/2 cup NESTLÉ® TOLL HOUSE® Semi-Sweet Chocolate Morsels. Cranberry-Nut Cookies: Add 1/4 cup dried cranberries and 1/4 cup chopped nuts. For Confetti Cookies: Add 1/2 cup candy-coated chocolate pieces.